Shall we mourn the Herald’s dusk? Australia’s changing media landscape from traditional print to digital has left many wondering of its effects on news reporting, political bias, and future of journalists in the industry. With speculation mounting of the impending demise of Fairfax Media’s print publications, the company has announced a renewed focus on competing in the digital sphere. The Sydney Morning Herald, Australia’s oldest continuously published newspaper and the flagship of Fairfax Media currently operate with a six-day run in New South Wales, Canberra, and South East Queensland. Recognised as the Herald, the newspaper has been one of Australia’s most powerful and influential voices for over a century. From early on the Sydney Morning Herald has taken up significant social roles in Australia’s democracy as well such as through the encouragement of women’s suffrage and ability to hold people of prominence to account. Priding itself with a focus on the reader many complicated stories have been brought to the surface including the Alan Bond, HIH Insurance, and Ansett business debacles. Fairfax Media chief executive Grey Hywood announced earlier this year that the company would be placing a greater focus on digital output following a rise in interim profits largely driven by revenue from its current online ventures. This comes as Fairfax Media undergoes a significant internal restructuring of its metropolitan newsrooms in a time where other major newspapers in the Western world such as The Independent in the United Kingdom closes its print editions after thirty years of publication. Telling investors that “[Fairfax has] a path to the future but… wanted the market to understand that the path was de-risked”, Hywood suggests that changes were necessary as global trends highlight the gradual unviability of newspapers in the business model. The demise of the Sydney Morning Herald and The Age in Melbourne both Fairfax Media newspapers or rather the shift towards online publication may be unsettling to some Australians including many who may wonder about the implications of such changes on Australian society and democracy. Australia’s geographical isolation has spawned a tradition towards the reliance on news media for information about the affairs of our neighbours in the region and across the globe. The Sydney Morning Herald and The Age arising partly from its long history in Australia coupled with its reputability for effective reportage have been central to this discourse. Despite questions of political independence stemming from the Sydney Morning Herald’s support of political parties over the past three decades, the historically conservative newspaper has arguably remained close to its masthead’s motto of “always independent”, at least much more so than News Corporation publications to a greater or less extent. Source: Roy Morgan Single Source January – December 2015, sample n = 50,278 Australians 14+. The decline of the “heavy lifting of civic journalism and investigative journalism” associated with The Sydney Morning Herald and The Age stems from a crisis in Australia’s civic journalism according to Eric Beecher, a former senior editor with Fairfax and News Corporation. 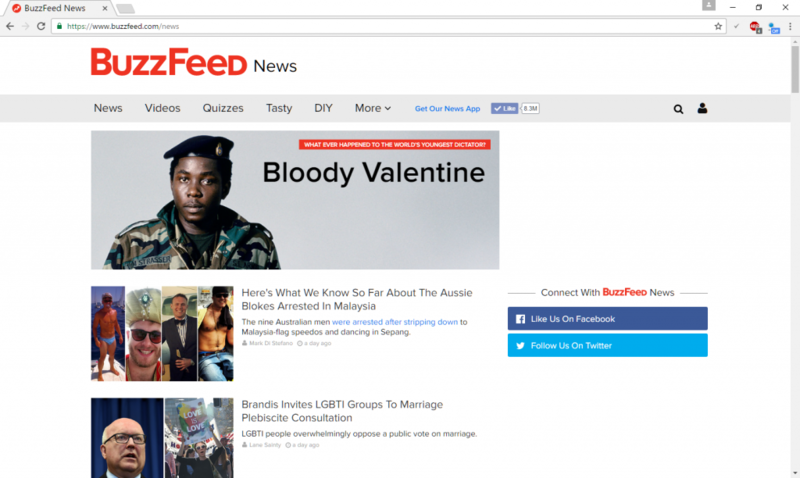 Traditional broadsheet journalism is gradually being displaced with online media with Buzzfeed.com, a prime example of the changing media landscape. There is an “undeniable [fact] that our industry is changing at a rapid pace” according to Paul Murphy, the Chief Executive Officer of the Media Entertainment and Arts Alliance. A key strength in online media that Buzzfeed has embraced in its successes in being a disruptive player against traditional print media is its culture of embracing constant change while at the same time being true to data-driven metrics in an uncertain business environment. The growing popularity of online media namely Buzzfeed has been in direct contrast to the rapidly falling popularity of print media in Australia with research suggesting that in the coming few years, a forty-five percent decline in printed newspaper circulation could be expected. Paul Murphy of the Media, Entertainment and Arts Alliance said that there is a “battle for readers [and that] the biggest competitors are no longer [traditional] rival news organisations, but blogs, apps, directories, aggregators, Apple News, Facebook, Twitter, Flipboard, Snapchat and a plethora of other social media”. In responding to such challenges, Fairfax Media has stressed that there are no immediate plans for a complete shutdown of print publication noting that The Sydney Morning Herald and The Age’s weekend editions generate sixty-five percent of the company’s revenue. However, this has not eased fears and worries by some commentators that even weekend print editions would remain profitable in the rapidly changing media landscape with the size of the Saturday edition shrinking by the year as well. Media research Associate Professor David McKnight at the University of New South Wales says that “only the weekend editions of the SMH and Age are profitable but that is not true of the Monday to Friday editions”. Fairfax Media has also cut over five hundred jobs from its metropolitan newspapers in the past few years according to the Australia Media Entertainment and Arts Alliance as the company downsizes on its news desks and printing presses. The Australian Media Entertainment and Arts Alliance has been a vocal supporter of journalists as their union as Fairfax Media announced its latest round of job cuts this year. Denouncing the decision to reduce the number of journalists at Fairfax Media, Paul Murphy said that the “dispute about job losses was really about something much deeper and more intrinsic to journalism: quality and differing visions of it from journalists and from media owners”. In its campaign for improved conditions for journalists, the journalists’ union has called for updated industry award standards in recognition of the “changing work patterns of digital journalism”. Responding to the restructuring of positions within Fairfax Media, Hywood denies that there is a lack of reporters on the ground pointing to the new use of non-news avenues such as Domain real estate and television streaming service Stan to uphold the company’s journalism. Senior investigative journalist at the Sydney Morning Herald Kate McClymont says that “the question remains as to whether digital media will be able to make enough revenue in order to sustain [heavy] investigative journalism”. Despite the disruptive outlook for the traditional Australian print media industry, senior journalists are remaining confident that there will continue to be demand for quality investigative and in-depth reporting regardless of the form of circulation. The company’s major printing presses in Sydney and Melbourne have also both been sold over the past two years as online media eats into the traditionally print dominated news territory. Associate Professor McKnight also warns that “any closure by Fairfax of its major newspapers would increase the advantage in the political influence which News Corp already has” noting that outside of the Sydney and Melbourne the only major daily newspaper is a News Corp publication. The further weakening of Fairfax Media’s reach within Australia would also significantly affect the availability of multifaceted perspectives of news coverage and political reporting which would benefit the readership of News Corporation through newspapers such as The Australian. In response to the new players in the media market such as online competitors like Buzzfeed, traditional newspapers face increasing competition for readership and with revenue being equally as important for the company, it is likely that further reductions to print are likely. Questions of how the reductions to resources for traditional journalism and print media circulation will affect Australia’s socio-political environment remains equally as unclear at present as the tension between Fairfax Media as an alternative to News Corp is also weighed heavily against the growth of online digital media outlets. Will the quality of reporting suffer from shrinking newsrooms and lower numbers of traditional journalists, such issues remain unanswered and pose for important aspects of observation as Australia’s media industry undergoes a period of disruptive changes in both the business models and news models for journalism. Will you buy the newspaper tomorrow or just scroll through an internet feed for your news? This article was written by Roydon Ng as part of his UNSW Master of Journalism’s Feature Writing course in October 2016.